The market dominance of UK supermarket giants Tesco, Asda, Sainsbury's and Morrisons is to be investigated for the third time in seven years. The stores control almost 75% of the £120bn UK grocery market and the Office of Fair Trading wants the Competition Commission to take a look. The watchdog said there was evidence that the buying power of big supermarkets could distort competition. It was also concerned about planning rules and supermarket land holdings. "This reference will allow the Competition Commission to examine in detail all aspects of the grocery market, ensuring that consumers are able to benefit from strong competition through even lower prices, improved quality and choice, and continuing innovation in the market," said John Fingleton, OFT chief executive. The commission has two years to come up with a decision, although it hopes to complete its review well before then. It will conduct its own, more in-depth investigation into the UK grocery market, and will talk to smaller, independent retailers as well as the bigger chains. Unlike its previous review of the supermarket sector in 2000, the commission now has power to act on its findings. It cannot hand out fines, but it could force the supermarket giants to sell-off some of their stores or change the way they run their business. 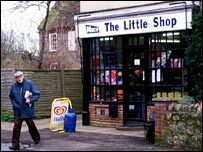 The UK grocery sector has come under the spotlight again because the UK's main supermarket groups have been accused by critics of driving local convenience stores from the High Street. Between 2000 and 2004, 7,337 independent retailers went out of business. Last year, the OFT announced it would not trigger an inquiry into the grocery sector, but it was forced to reconsider its decision after the matter was referred to the Competition Appeals Tribunal. In March, the OFT said it would consult again about the state of the grocery sector ahead of a possible investigation by the Competition Commission. The major supermarkets' power had increased, and "some aspects of their pricing behaviour - such as below-cost selling and price flexing - could distort competition".